ALL-AMERICAN: John Weaver visits the fair Sunday with his wife of 41 years, Carol. John's motorized cart is decked out with American flags. 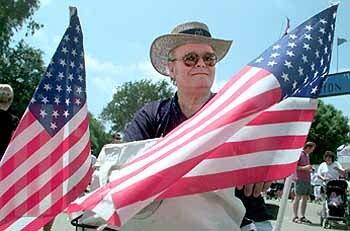 John Weaver rolls through life with flags on his wheelchair. Reporter Antonio A. Prado found his story at the fair. Every waking moment, John Weaver is in pain. But that doesn't stop him from getting out and about. On Sunday, his decade-long trek through life on a motorized cart brought him to the Orange County Fair with his wife of 41 years, Carol. Decked out with American flags, Weaver's cart slowly wheeled him through the sea of humanity creeping along the fair's streets. "They've got to move eventually,'' said Weaver, 60. Since becoming disabled from diabetes and a severe back injury, he has persisted slowly through life. Weaver said he never misses weekend swap meets at the fairgrounds, though he spends most of his time at home in Huntington Beach watching television. Weaver was first injured 30 years ago while lifting a steel bar. He didn't realize that the floor at the box-making shop where he worked was wet. He slipped and fell. After the first surgery, he could no longer do heavy physical labor. He began wiring new homes during the late 1960s in Huntington Harbour. "The housing boom ... that was real good there,'' Weaver said. He has worked "six or seven'' jobs during his life, he said, mostly in industry. Seven of those years were spent as head roaster for Folger's coffee. Weaver was forced to retire in 1981 because of his worsening back condition and diabetes, which eventually cost him a foot. The side effects of strong pain-killers make it impossible for Weaver to work because they rob him of his alertness and dexterity. A medicine pump, surgically implanted on his right side, delivers medication constantly. The longing for that feeling takes him outdoors as often as he can handle it. As he rolls through life on his cart, Weaver doesn't want people to forget America's greatness. He displays the flags proudly, so the world knows that he's happy to be an American. "I was born and raised here, and I'm proud of it,'' he said.